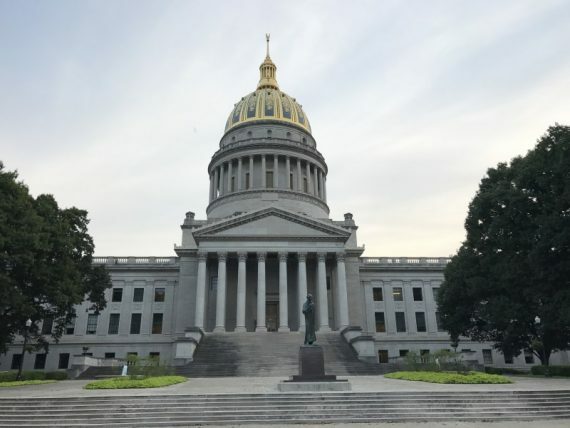 Our first stop this morning was to visit the West Virginia State Capitol, which was just a few blocks from our hotel. 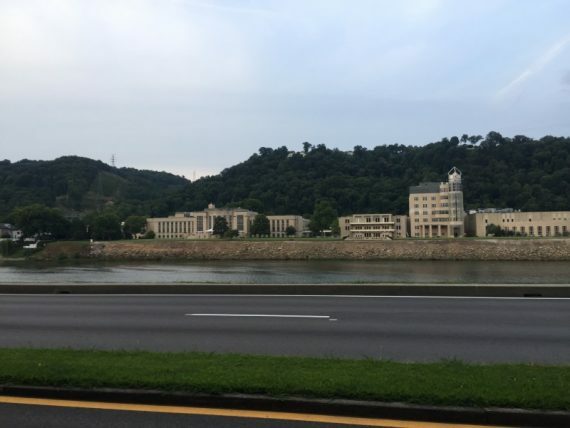 To get there, we traveled on Kanawha Boulevard, which was nestled right up against the mighty Kanawha River. This was very reminiscent of Riverside Drive in Tulsa up against the Arkansas River (except the Kanawha appears to always have water in it). The capitol building itself had a gorgeous gold leaf dome, and it was perched on the grounds right up against the boulevard and the river. It’s hard to imagine a more impressive location for any of our other state capitol buildings. View across the Kanawha River from the Capitol. There were zero other cars when we took these at 7:15am, so we just parked in the street. 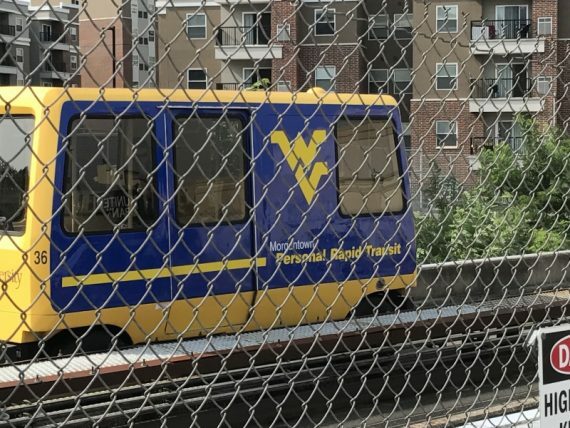 Our first destination of the day was Morgantown, West Virginia, home to West Virginia University. I don’t know how many other opportunities we will get to see the campus of this Big XII Conference brother. The landscape was more of the same from yesterday, although more mountainous. Trees everywhere, and little else. On a rare occasion, we would see a small group of cows standing on a hillside. KK remarked that all the cows around here needed to have two legs longer than the others. There is no such thing as flat ground. 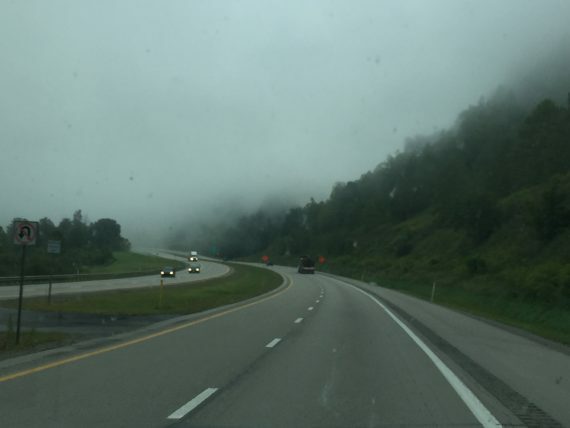 Low clouds driving through West Virginia. I have not been to very many “hilly” campuses, but I have been to the Arkansas campus in Fayetteville. I used to think it was hilly. Fayetteville does not know what hills are. 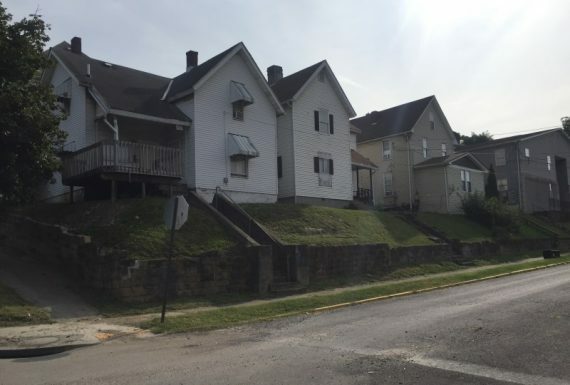 The WVU campus was insane. We drove up several streets in town that were reminiscent of the first initial climb on a roller coaster. Straight up and straight down. If you want to get in shape and get a degree, I cannot recommend WVU highly enough. The campus was attractive in the sense that it was built on hills, but none of the architecture matched, so it was a fun game to guess what decade a building was built based on the design. We found Puskar Stadium right on campus, so we double parked in the employee lot to take a few pics. 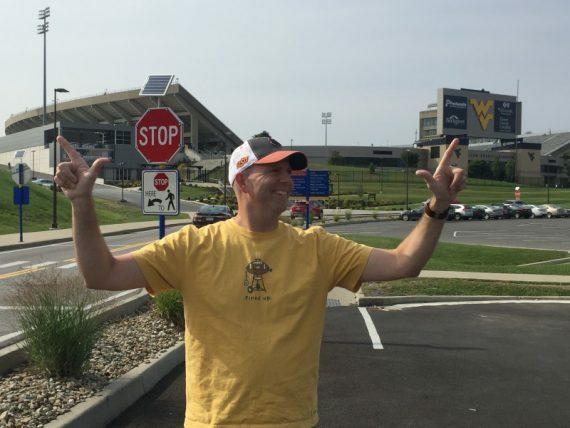 Pistols Firing from Morgantown! KK said, “Turn your head a little so I can see your cap better.” Hence the pic of me gazing off into the distance in this shot. 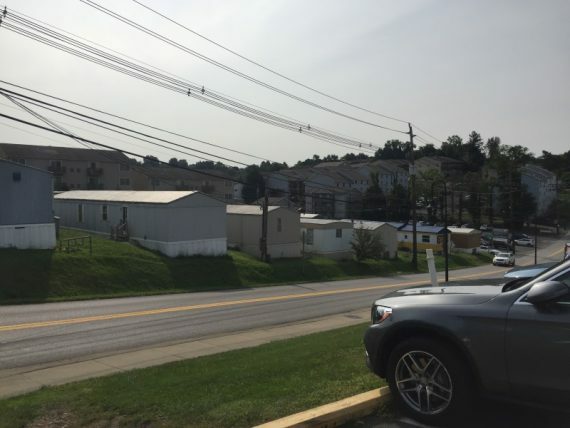 This trailer park was located directly across the street from the stadium. Submitted without comment. 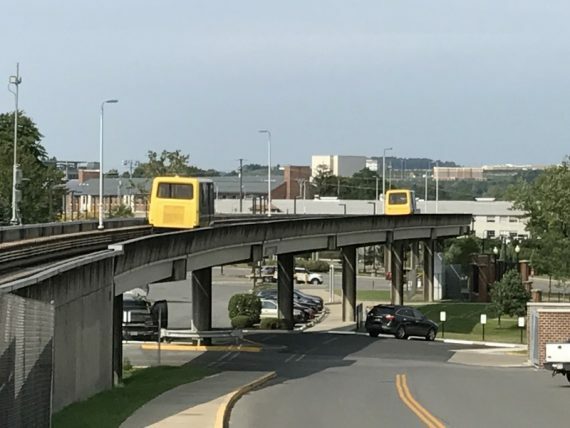 One of the quirks of the WVU campus is their Personal Rapid Transit (PRT) system that looks similar to a monorail (but isn’t). Little blue & gold pods can you take you all over the campus. A great strategy to combat the fact the campus is built on the side of a mountain. While I am thinking about it, I have a whole new appreciation for the WVU mascot now – the Mountaineers. Close-Up of a PRT pod. Two pods traveling down the track. We pulled out of Morgantown and began making our way east. We were going to cover a lot of ground, and a lot of states, today. We made it a point to stop at every state’s Welcome Center, which helped break up the monotony. The view from the Maryland Welcome Center. Not bad. While at the Maryland Welcome Center, it was where we first learned of “The National Road” which went right through this area. (Also known as the “Cumberland Road”.) Thomas Jefferson authorized the road in 1806 to help with westward expansion and trade. The road ultimately went from the coast all the way to Vandalia, Illinois. 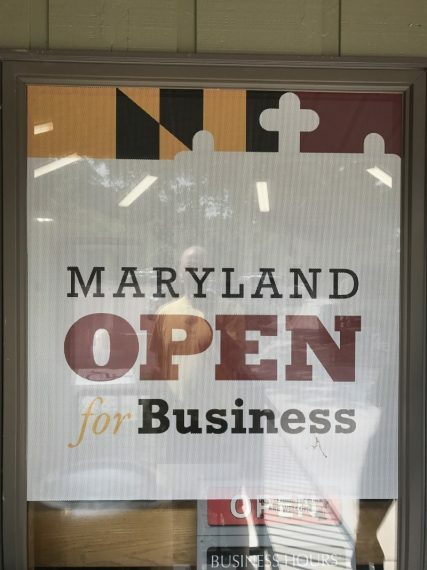 We also saw a large poster describing the road at our lunch stop in Maryland, so I take it that it is a big deal in these parts. 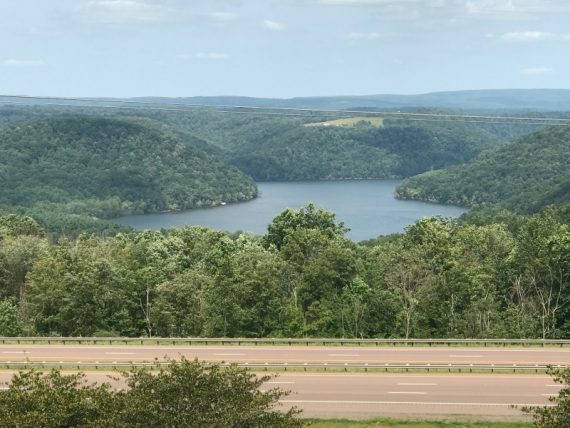 While driving through Maryland, we spotted the Appalachian Trail, the 2200 mile long hiking trail that goes from Maine to Georgia, and also the Eastern Continental Divide. Nearly every exit promoted either a National Landmark, or State Park. For this entire trip, we have felt like we’ve had the entire road to ourselves. There has been no traffic to deal with. But that all changed about 20 miles outside of Baltimore. The traffic started picking up and we experienced a number of slowdowns during the rest of the journey. To reiterate some previously made points, I’m not sure there is a naturally flat piece of land between Lexington, Kentucky, and Baltimore. The terrain was remarkably consistent during the entire journey. Packed full of trees and hills. Hard to understand how there could have been much farming or industry back in the day. From Maryland, we traveled into Delaware. Wilmington was another large city that we got to travel past today. 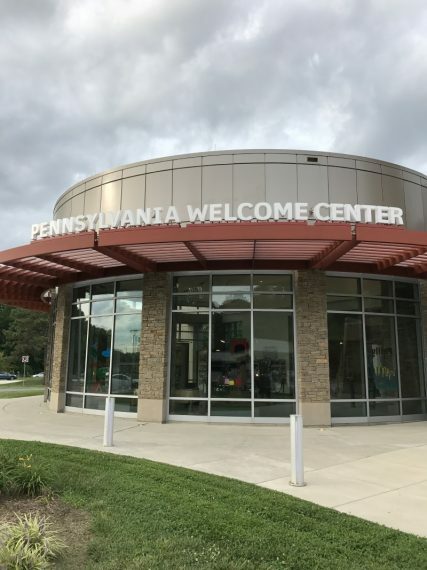 We stopped at the Delaware Welcome Center / Travel Plaza. It reminded me of the food court at an airport. Lots of travelers were in here getting food and Delaware souvenirs. I heard several conversations in foreign languages. 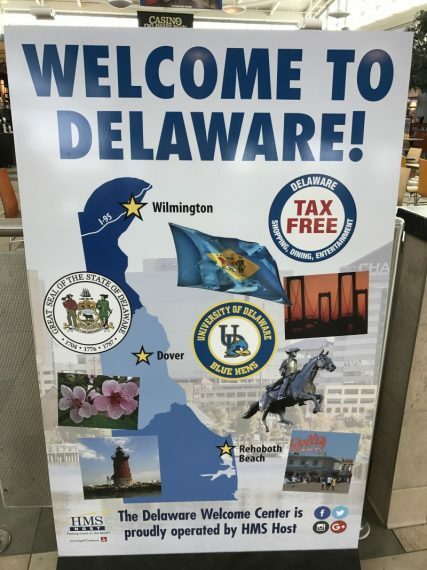 Of course, one of the best things about Delaware is that the state bird is the Blue Hen and Delaware University’s mascot is the Fightin’ Blue Hen. Our next and final state of the day was Pennsylvania. While you know that all of the major metro areas in the northeast are situated very close to one another, it is still a shock from the system to go from Baltimore to Wilmington to Philadelphia in the course of a few hours. Compare that to traveling from Tulsa to OKC, Dallas or Kansas City, where you are a good 3 to 4 hours between cities. We found our rental home for the week by 6:30 and even met a few friendly neighbors. Our big plans for the evening consisted of a trip to the grocery store for a few essentials, and getting settled. Tomorrow, the Philadelphia touring commences.